The first question for many is what is an Interrotron? Essentially it is the use of a traditional prompter but instead of the words in the script the presenter sees the interviewer's or director's face. This technique was pioneered by American film director Errol Morris in his film The Fog of War which won an Academy Award for Best Documentary Feature. "Teleprompters are used to project an image on a two-way mirror. Politicians and newscasters use them so that they can read text and look into the lens of the camera at the same time. What interests me is that nobody thought of using them for anything other than to display text: read a speech or read the news and look into the lens of the camera. I changed that. I put my face on the Teleprompter or, strictly speaking, my live video image. For the first time, I could be talking to someone, and they could be talking to me and at the same time looking directly into the lens of the camera. Now, there was no looking off slightly to the side. No more faux first person. This was the true first person." Today we are finding that programme makers are now using Interrotrons also as an alternative to the more traditional use of "word" prompting. This tends to be in corporate videos where often one is working with inexperienced presenters who may not be comfortable in "reading" the script or are intimidated looking directly at the raw lens. 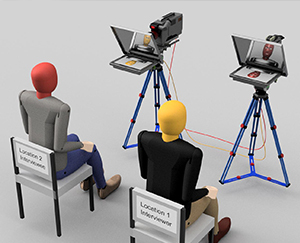 Using an Interrotron means that the director can coach a natural conversation from the presenter (tell me about xyz) who now has a human face to react with. You also have the "through the lens" credibility and as with all prompting styles you are minimising the amounts of takes, to get the perfect one, saving production cost! We offer today, two variants or sale or hire. A Passive system which uses reflections by way of the customized prompting hood and reflector and an Active system which takes a video signal from a second camera to feed the prompter display. How a Passive Interrotron works? - We take the usual prompting rig but remove the monitor and change the angle of the glass from reflecting the monitor at 45° to 90. We then turn this to the left or the right so the presenter whilst still looking down the camera lens, can also see the reflection in the glass of the director who is sitting to either left or right of camera. This allows the presenter to maintain eye contact down the lens and react with the director. Very simple, effective and cheap (we rent this rig out for £75 plus Vat a day). One tip is to use a simple office screen between the 2 people to break the direct eye-line makes sure the presenter keeps looking at the camera. How an Active Interrotron works? This to all intent and purposes is a normal prompting rig but instead of a prompting software source (the script) from a PC the prompter head-up display is fed by a second camera which is capturing the director for the presenter to see. It is more like a video conferencing device and does mean that the director and presenter can actual be in a different locations or even countries whilst still maintaining that all important down the lens eye contact. We have one client who regularly hire theses for one of their shows where they have a presenter in Bristol and another one in London and by using this technique are able to save significant crew and travel costs using Interrotrons but which to the viewer makes it look as if they are in the same place and location and talking to each other! All of Portaprompt's standard ranges, the 365 Personal Prompter, the Fusion mid-budget Range and our Broadcast Premium and Quasar Range have Interrotron functionality built in as no extra cost! Summary and benefits - I wished I had known about this before I joined Portaprompt as it would have been the prefect prompting tool for the in house video productions we used to produce for my old company. Our presenters tended to be from our marketing team and whilst very knowledgeable on the kit and story they were not necessarily all that great as presenters and even when reading prompt some could be rather stilted and we could be doing 10 takes which just ate time, confidence and cash. The Interrotron takes these limitations away and certainly what we are finding is that this little known technique when understood can add real value at very effective costs. It moves prompting from just "reading words" to an interview style approach and builds confidence to camera while maintaining the all-important eye line - a real production advantage!